Today we did update our Modern Millenaire server and pack to version 2.2.0.0! This update is a major overhaul of the pack. Additionally with this general update, we added some mods to get you into Christmas mood. The whole world is now covered in beautiful white snow and ice. You also can decorate your house with fancy Christmas items (search NEI for Wintercaft). 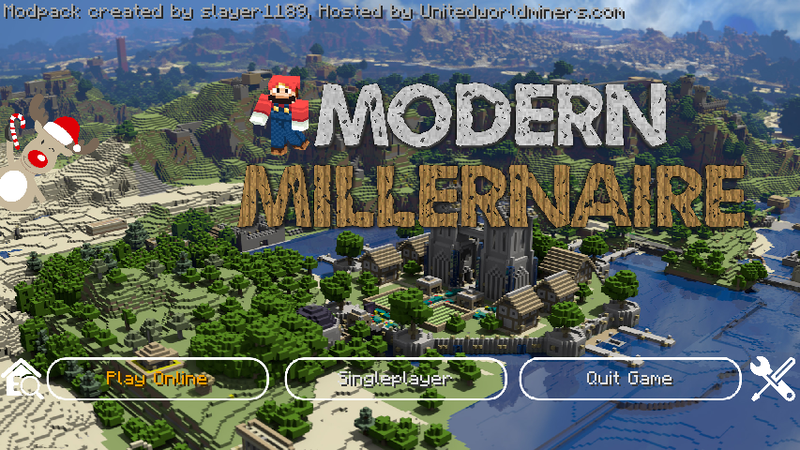 If your waypoints are lost, select the „Modern Millenaire“ Modpack in your Technic Launcher and click on „Modpack-Options“. In there click on „Open“. This brings you to your Modpacks root folder. In there navaigate to journeymap > data > mp. This should contain a two folders. One named „millenaire.unitedworldminers.com.“ and one called something else. First create a backup of both folders, then delete „millenaire.unitedworldminers.com.“ and rename the remaining folder to millenaire.unitedworldminers.com. After relaunching the Modpack your waypoints are back! For those people who want to join a another server / LAN world except from the official server, feel free to select the „2.2.0.0-NO-Menu“ version of this pack from your Modpack-Options.